Once again the GCA will be venturing south for the MLK holiday weekend to paddle some of Florida’s beautiful springs and rivers. We will be setting up our base camp at the Chassahowitzka River Campground and doing day trips from there. We will be driving down on Thursday, January 17, 2019 and paddling the next four days (Friday, January 18, 2019 – Monday, January 21, 2019). I will be on campsite #53 and would love to have GCA members camping near me but you do need to contact the campground to make your own reservations. Their contact information and campground details can be found at http://www.chassahowitzkaflorida.com/. Potential paddling locations include (but are not limited to): Withlacoochee River, Chassahowitzka River, Ichetucknee Springs, Crystal River, Weeki Wachee, Rainbow River, Silver River, Braden River, etc. IMPORTANT INFORMATION: This is an official GCA trip. You will be expected to wear your PFD, not just have it in your boat. Also, this trip is for GCA members – not the general public. Please do not post this trip on other websites. 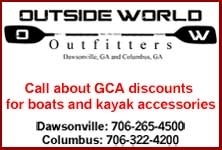 Please contact me, Lisa Haskell, by email at lshkayaker@gmail.com or by phone at (678) 858-2012 to register for this trip. Using the RSVP button on the website does not mean that you are signed up for the trip.